Sometimes the IRS uses wage garnishment to settle tax debts. If back taxes haven’t been paid despite having received several warnings, the IRS can take a portion of your wages to settle these debts. The process for wage garnishments is quite elaborate. First, the IRS sends a notice that details the amount owed, including penalties, interest, and a due date. If this notice is ignored, a final warning called the ‘Final Notice of Intent of Levy’ will be sent. Thirty days from that point, the IRS can initiate the wage garnishment process. A notice is then sent to your employer, who is thereby made aware of your back tax problem and required to give the IRS a portion of your wages. Wage garnishments are a severe type of tax levy, which can negatively affect your livelihood. If you’re living pay check to pay check, wage garnishment could cause problems with paying other important bills. While the IRS has a limit on how much it can garnish, it is possible that incorrectly filled forms from your employers could result in garnishments in upwards of 75% of your pay check. Unfortunate situations like this should be immediately addressed. Wage garnishments can be released using an installment payment plan. If there have been no previous tax offenses, another form of release from wage garnishment includes cases of extreme financial hardship. Wage garnishments are not to be taken lightly. Obtain the service of a certified tax professional for reprieve if you find yourself dealing with tax problems such as wage garnishment. The experts at Long Island Tax Resolution will thoroughly examine your case. We will work diligently to remove your wage garnishment in whole or in part. We will work with the IRS to reduce the garnishment of your wages, file outstanding tax returns, and setup an installment payment plan to settle your debts in the most painless way possible. Contact us to learn more about how we can help reduce your wage garnishment! Non-payment of income taxes or failing to make arrangements to settle IRS tax debts gives the IRS the power to seize any type of property or money from your accounts. This power does not require a court’s permission. It is called a tax levy or, more specifically, a bank levy, which occurs when funds are taken directly from your bank accounts. After due assessment by the IRS, you receive a notice and demand for payment of tax. You either refuse or neglect to pay the tax. There are different types of account levies. A ‘one shot’ levy is when the bank takes the total amount owed and sends it to the IRS. A ‘continuous’ levy, like wage garnishments, deducts money from your account regularly. As you can see, levies can be detrimental to your financial situation and livelihood. Luckily, the IRS has a provision to release the levy and establish a repayment plan according to your specific financial situation, but it can be difficult to initiate the process. A certified and experienced tax professional will ensure you secure the best tax levy relief. 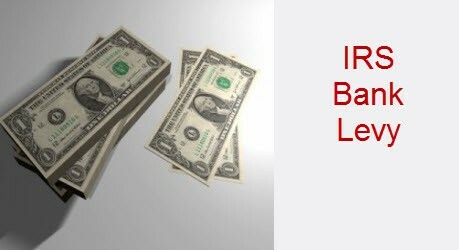 Our highly professional tax experts will help you file the appropriate paperwork to lift the IRS bank levy as soon as possible. Our team offers affordable strategies to solve tax resolution problems.